all of his NHL teammates and the rest of the players in Sochi with his stellar play . I'm really not sure what there is to say about Maatta that wouldn't make it seem like I'm trying to kidnap him. He's amazing. He's only 19-years old, yet he's played all but one game for the Pens this year while playing at an amazing and consistent high-level every night. In my opinion he should definitely be in one of the running for the Calder trophy, which is given to the NHL's rookie of the year. In seems like a long time ago, but remember that Maattta might not have even stayed in the NHL this year had it not been for an injured Kris Letang. Then there was the huge debate regarding whether the Pens should keep Maattta up in the NHL or allow him to go back to the juniors. Safe to say that the Pens made the best decision. 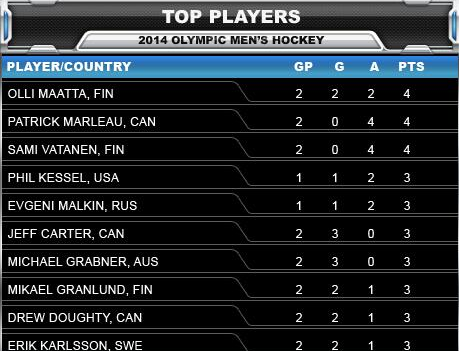 Maatta, a 19-year old NHL rookie defenceman, is currently tied with Partrick Marleu as the leading scorer of the 2014 Olympic hockey tournament. That is insanely impressive. Maatta has two goals, four points, and is a +3 through the first two games of the Olympics. I'm trying not to get too ahead of myself when it comes to expectations, but Maattta certainly looks like he can groom into a future Norris Trophy winner. His ceiling as a prospect before year was top 4 defenseman, but it's safe to say that projection is in serious need of an upgrade. At this point the Pens organization and their fans have to be praying, or doing whatever other kind of rituals they can, to hope that Maattta never leaves Pittsburgh. At 19, he shows a level of maturity that I won't have when I'm 35. The best part of all of this is the fact that the Philadelphia Flyers passed on Maatta in the first round of the 2012 NHL draft, along with 21 other teams. The poise that Maatta plays with, given his age, is truly unmatched. He looks like a 19-year old Nicklas Lidstrom. For his age and experience, his consistency and poise is really unmatched. His two-way play is truly remarkable and it's scary to think how much better he can be when he hits his prime. My favorite part of Maatta, other than his consistency is his ability to make up for mistakes without becoming rattled. Given his age and the big stages that he is playing on this year, he seems to be able to shake off any mistake that he makes. The next shift he usually comes out and completely makes up for his error and it's typically does it in a big way. For example, in his first Olympic shift in his first-career Olympic game, Maatta was on the ice for a goal against. He followed that up with a goal against going off of his very own skate. No Maatta (Pun very much intended), as the young stud was able to make up for those mistakes with a big-time blast from the point to tie the game. That's what makes him a special player. As for now, Maatta is in contention to win the MVP of the 2014 Olympic hockey tournament at the age of 19. The sky is the limit and I'm damn glad he's playing for the flightless birds. I hate to bring Letang into this, but certainly Maattta's speedy progression along with Letang's huge cap-hit and health concerns could favor the Pens in seeking a trade involving Letang. It's just a thought, but Maatta could easily become the future cornerstone of the Pen's blueline sooner rather than later.